With all the gas-powered vehicles on the road these days, drivers often forget they have to share it with the pedal-powered kind. 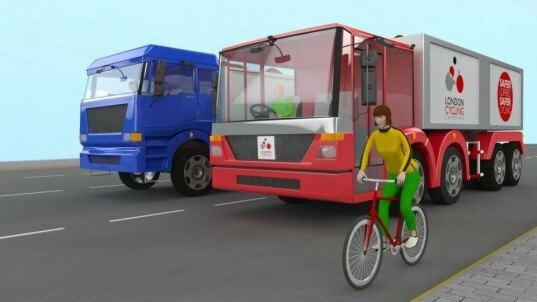 Approximately 50 percent of all cycling fatalities in Greater London involve large scale lorries (trucks), and about three-quarters of those vehicles are from the construction industry. 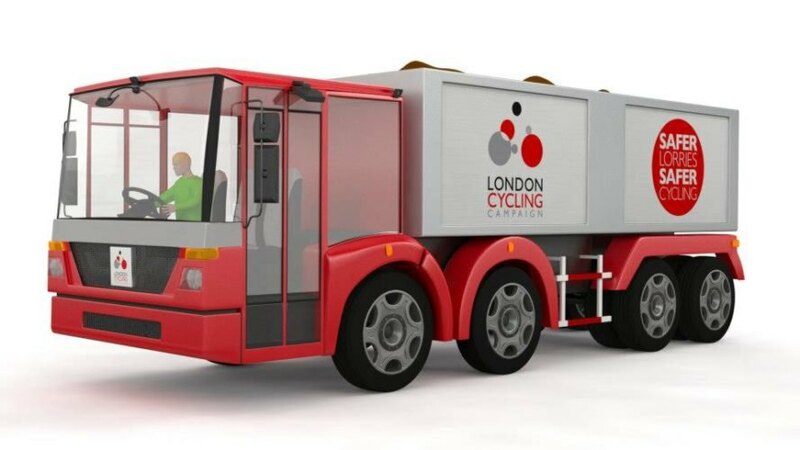 In the interest of protecting bike commuters, the London Cycling Campaign recently released its Safer Urban Lorry design: a new type of truck that makes it easier for drivers to spot and avoid cyclists. One might assume that designing a truck is far outside the realm of an organization dedicated to bikes, but the LCC got a head-start by incorporating technologies used in another type of truck: garbage collectors. The most common response from lorry drivers after a fatal crash is to say they didn’t see the victim in the moments leading up to the crash. In London, modern garbage trucks have a more open cab design that minimizes the risk of running over refuse collectors working close to the vehicle. It’s this strategy that LCC used as a jumping off point for its Safer Urban Lorry. The new design features a driver seating position that is approximately two feet lower than in a conventional construction lorry, which provides the driver with a much improved view of what’s happening around the vehicle, significantly reducing risk to anyone in the immediate area. The windshield and side windows are much larger in the LCC design than those found in today’s construction lorries, which means enhanced visibility to the front and the side. The area to the front-left of the lorry, where the vast majority of lorry-cyclist collisions occur, is also clearly visible. The LCC truck also sports a low rear bumper and sideguards that increase the likelihood of a cyclist being knocked away from the lorry in the event of a collision, rather than being dragged under its rear wheels and suffering much more serious harm. An early-warning camera system provides a 360-degree view around the lorry inside the cab, ensuring the driver is aware of pedestrians and cyclists at the sides and rear of the lorry, even if they’re not directly visible. “Our Safer Urban Lorry design is a challenge to the construction industry to use vehicles that help reduce the terrible number of people on bikes and on foot who are killed by lorries,” said Geoff Lee, whose wife Hilary was killed by a lorry while cycling in Barnet in October 2012. “The restricted view from the cab of many of today’s construction lorries means the driver often has little or no idea who or what is in their immediate vicinity, which is totally unacceptable. The construction industry has a duty to do everything it can to prevent more people being killed by its vehicles. Perhaps if more lorries were designed like this lorry, then fewer innocent people would die on our streets,” Lee continued. One might assume that designing a truck is far outside the realm of an organization dedicated to bikes, but the LCC got a head-start by incorporating technologies used in another type of truck: garbage collectors. The most common response from lorry drivers after a fatal crash is to say they didn’t see the victim in the moments leading up to the crash. In London, modern garbage trucks have a more open cab design that minimizes the risk of running over refuse collectors working close to the vehicle. It's this strategy that LCC used as a jumping off point for its Safer Urban Lorry. The LCC truck also sports a low rear bumper and sideguards that increase the likelihood of a cyclist being knocked away from the lorry in the event of a collision, rather than being dragged under its rear wheels and suffering much more serious harm. An early-warning camera system provides a 360-degree view around the lorry inside the cab, ensuring the driver is aware of pedestrians and cyclists at the sides and rear of the lorry, even if they’re not directly visible. “Our Safer Urban Lorry design is a challenge to the construction industry to use vehicles that help reduce the terrible number of people on bikes and on foot who are killed by lorries," said Geoff Lee, whose wife Hilary was killed by a lorry while cycling in Barnet in October 2012. “The restricted view from the cab of many of today’s construction lorries means the driver often has little or no idea who or what is in their immediate vicinity, which is totally unacceptable. The construction industry has a duty to do everything it can to prevent more people being killed by its vehicles. Perhaps if more lorries were designed like this lorry, then fewer innocent people would die on our streets," Lee continued.